Anybody can make maps and stock them with monsters and treasure. You can even do it randomly. Off-the-cuff refereeing is a skill that indeed requires no outside support, be it commercial or free. But I know when I buy an adventure, I am seeking in-depth descriptions that make the map and the contents of the location come alive, and hopefully in a way that I would never have done on my own. When I run someone else’s adventure, it’s because I want the challenge of running something different, to present my group with something different. Changed names to integrate a work into my setting aside, I don’t want to make an adventure “my own.” The whole point is to escape that for a bit and to charge my own creative batteries by basking in someone else’s creative light. I would add a few more practical considerations that favor modules. The first is that it’s almost always easier to learn from examples than it is to learn from manuals. Any programmer will vouch for that insight. The second is that modules provide communal shared experiences. The third is that time is limited. It’s not hard to bake bread, but I still often defer to the baker. Division of labor, baby! This entry was posted in Uncategorized and tagged quote on August 10, 2012 by Necropraxis. For me this goes double for really good adventures included in a core book that actually illustrate what this game is about. B/X was great for this: it gave you models of how to do your own adventures without boxing in your creativity. The adventure in the 1e Warhammer book was a similarly-great starting point. Frankly, some games are utterly mystifying without an example adventure to show you the ropes. Many years ago I was a confirmed module-basher, possibly because I was one of those players who spent more time reading, planning and thinking about roleplaying games than actually *playing* them. Now I’ve got less free time and want to spend more of it having fun with my friends, and less of it imagining my perfect RPG campaign, I’m far more sympathetic to the idea of predesigned bundles of gameplay. I still don’t *use* them much, but I’ve stopped making a Big Thing out of it. Good adventure modules are tiny masterpieces with which players can build some story, everytime different, that is why people played some classic modules for 6 times with the same group. Thanks to randomness and level of interactivity they offered unpredictable play. Bad modules are hack, slash, loot ones, and they dominate OSR publishing. And third type, adventure scenarios, are not modules at all. I don’t think anyone hates the first mentioned type (example of which is Book of Treasure Maps or The Lost City). Modules can be valuable part of wilderness campaign. I don’t disagree with the list of qualities that you associate with good modules. I’m not sure which OSR modules you believe are “hack, slash, loot” though, as that has not been my experience. In fact, in my experience, OSR modules tend to be more aware about the reuse value of site-based adventures (like B4 The Lost City, which you mention above). If you’re going to trash “OSR” modules, I think you need to give some concrete examples. The three modules in the picture I included are all OSR modules, and I can give you many other quality examples. That being said, even many well-designed modules (from the campaign point of view) are not well-designed from the referee point of view (in terms of actual use at the table). For example almost all One Page Dungeons from the contests. 1. The one page dungeons are a small part of OSR output. 2. OPDs are more of a (brilliant) format for presenting zones. 3. The contests are halfway between blogs and publishing. Hatin’ on modules???? What kind of deviant mind would hate modules? Unless, of course, you mean DragonLance modules. I can see, philosophically, where adventures are bad for D&D in general but I still use them (for time reasons mostly). What I would like is for people to rethink the format of adventures so they can be better shared and mined for ideas. For example, instead of a single 8×11 graph paper map with a separate booklet with descriptions, break the adventure into lots of small sub-maps each with their own description and non-specified exit and entry locations. 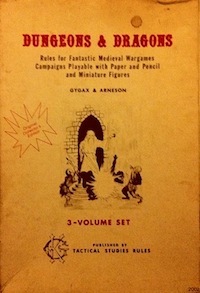 That way a DM can take only the portions of a published adventure he likes and combine it with other locations seamlessly. Also, instead of a large hex map sandbox, split the world into groups of hexes (say 5×5 five mile hexes making up one 25 mile hex) If these megahexes where geomorphic, DMs could rearrange them as they see fit to create the game world that appeals to them. This is exactly how I am doing my own campaign prep now. It’s basically the one page dungeon insight, but expanded to every potential zone of exploration (be it wilderness, enclosed, or other). I don’t think adventures are philosophically bad, though some adventures can be just low quality. Adventures are just examples of how you might want to approach something. Good adventures are good examples. When I say adventures are bad, I mean that TSR could have produced products to show DMs how to create their own game worlds or adventures but instead just fed us their version. Sure, you can learn about adventure design from reading adventures but most of the early ones were tournament modules which aren’t really good for campaign play. Also, things like the Greyhawk Folio are the opposite of what DMs need, being a large world sparsely detailed instead of a small area highly detailed. All the GMing advice in the world doesn’t mean jack if they can’t write a module to show you what it actually means.